A sky-high column of glowing plasma has influenced countless religious ideas. The mediaeval scholar-monk Johannes de Sacrobosco (c. 1195 – c. 1256) was a renowned computist – expert in the calculation of the correct date of Easter in the Christian calendar. 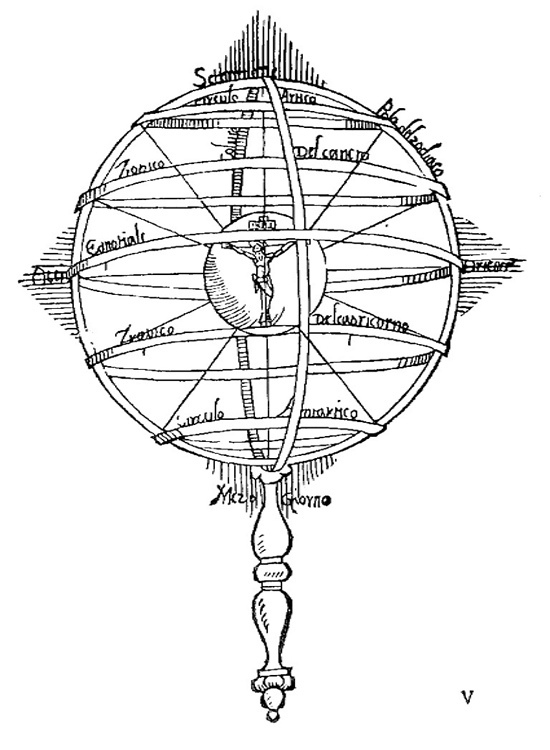 His Tractatus de Sphaera (c. 1230) contained an illustration of an armillary sphere, on which the author of an Italian translation, Fra Mauro Fiorentino (1492-1556), put a Christian spin by attaching the figure of a crucified Christ to the rotational axis of the central earth. Though Fiorentino’s twist may seem whimsical, it really evinces a widespread sentiment in Christendom. The motto of the Carthusian Order, coined by Dom Martin in 1233 CE, bespeaks a similar mindset: Stat crux dum volvitur orbis, ‘The cross stands still while the world turns round’. ‘… for it is right that He being made visible, should set upon all things visible the sharing of His cross, that He might show His operation on visible things through a visible form. For He it is who illuminates the height, that is the heavens; and encompasses the deep which is beneath the earth; and stretches and spreads out the length from east to west; and steers across the breadth of north and south; summoning all that are scattered in every quarter to the knowledge of the Father’. ‘For as we lost it by means of a tree, by means of a tree again was it made manifest to all, showing the height, the length, the breadth, the depth in itself; and, as a certain man among our predecessors observed, “Through the extension of the hands of a divine person, gathering together the two peoples to one God”‘. From the start, theologians viewed the cross of Christ as a symbolic emulation of the paradisiacal tree of life. According to a popular tradition, paradise had been situated at Jerusalem as the cosmic centre. As Adam’s skull was buried beneath Golgotha in the wake of the deluge, at the very spot where the crucifix was erected afterwards, this earliest ancestor was conveniently ‘baptised’ by the blood of the Redeemer. Thus, the Book of Adam and Eve has Noah commanding his son to ‘lay the body of Adam in the midst of the earth … for in that self-same place shall God work salvation for the whole world’. A life-giving column at the earth’s navel, reaching from the highest heaven to the deepest hell, surmounting the tomb of a distant ancestor, spanning the width of the earth and transporting souls to the abode of God – far from a mere Christian fixation, this nexus of ideas resonates cross-culturally in the mythology of the axis mundi. At its heart is the global story of a giant luminous cable once seen to extend from the horizon to the upper atmosphere. All over the world, story-tellers recalled the prodigy as a veritable ‘life-line’, alive itself and quintessential to the origin and sustenance of all other life. Contrary to what was previously thought possible, interdisciplinary analysis now underscores the feasibility of such a phenomenon: sometime within the past 12,000 years, near-earth plasmas may have organised themselves in the form of a giant atmospheric z-pinch, visible worldwide. Crucially, such high-energy density plasmas follow a physical regime so chaotic and complex, so abundant in form and movement, that the baffled observer often cannot help imputing a life-like character to the matter – as if this plasma tube was itself endowed with life. Thus, spellbound witnesses could well be forgiven for their impression that this animated, dazzling stream of light facilitated the most profound form of spiritual enlightenment imaginable. While this hypothesis leaves many questions hanging, it is faithful to received tradition and may prove quite redeeming to pursuers of dead ends in science and scholarship.